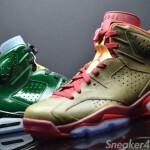 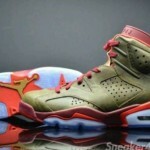 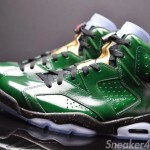 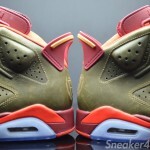 Nike has finally announced release details for the fabled Air Jordan Retro 6 Champagne and Cigar championship pack. 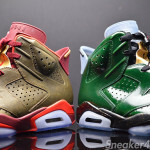 Acording to their official release lineup these two color ways will drop on June 14th and be available individually for $250 each. 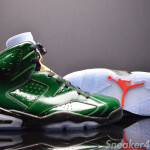 Altho we expected a price hike due to premium materials and limited availability, $250 does give a bit of sticker-shock to the sneaker community who is barely warming up to $170 Retro Jordan retail prices. 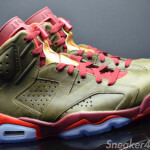 While higher prices do ward off some resellers nervous about getting stuck with unsold stock, with limited releases like this it’s a sure thing and only serves to even further increase resell prices. 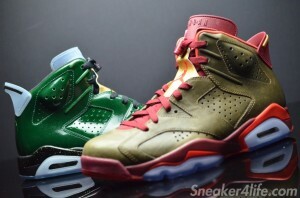 If you’re hoping to cop a pair, they will be available online at nike.com and in store at very select retailers on 6/14. 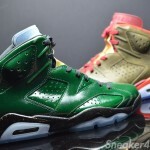 Incidentally this is the same day the Retro 11 Low Cement Black and Jordan Future Obsidian release.